It was a picture that went viral on social media — both criticized and celebrated for its unapologetic poke at those in power. Erica Violet Lee posted a selfie on November 29th from the 2015 Paris Climate Change Summit. In it she was sticking her tongue out while Saskatchewan Premier Brad Wall passed by in the background. It was a picture that went viral on social media — both criticized and celebrated for its unapologetic poke at those in power. Erica Violet Lee posted a selfie on Nov. 29 from the 2015 Paris climate change summit. In many ways it was a typical pose, capturing a smiling, mischievous Lee looking out from the frame. 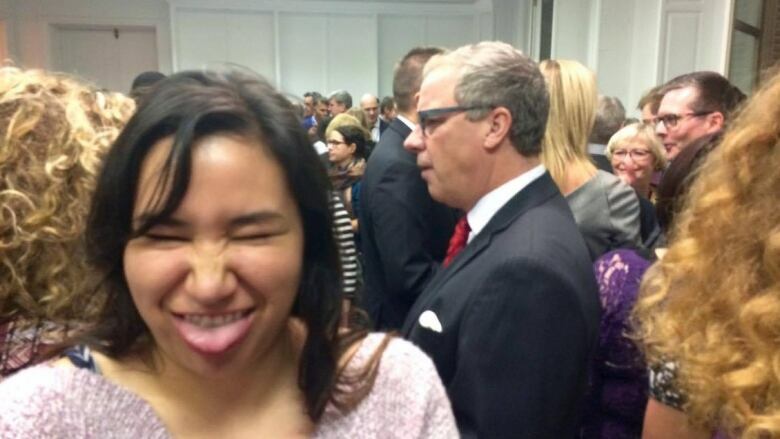 Except she was at a Canadian delegation party full of premiers and politicians, and the young Cree woman was sticking her tongue out while Saskatchewan Premier Brad Wall walked behind her. 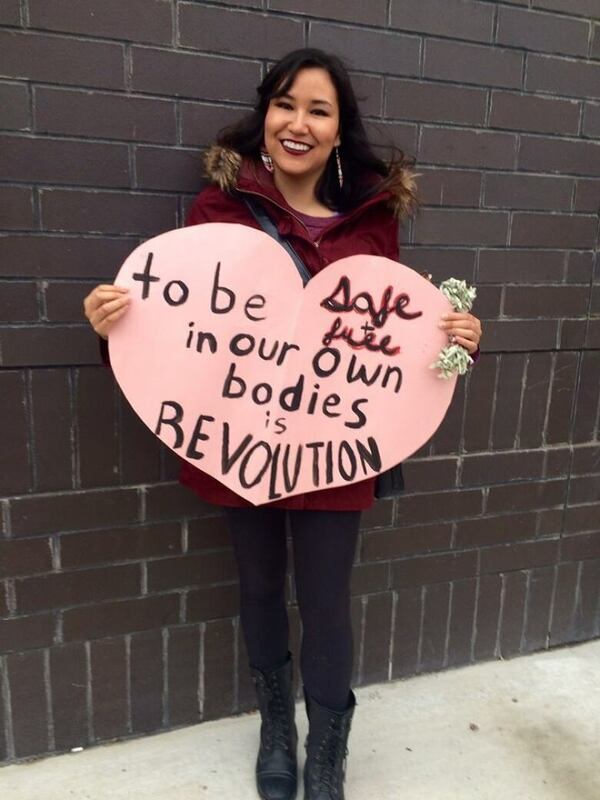 "It wasn't planned," the University of Saskatchewan student and activist recalled. "[I was thinking] How do I even begin to challenge all the privilege that's in this room? How do I even begin to say what you're doing in the North is wrong? The way you have ignored indigenous people is wrong. So I just thought of everything and ended up just sticking my tongue out." She posted the pic on Facebook and Twitter, and didn't think anything more of it. But it quickly spread online, and soon Lee was inundated with messages ranging from delight to disgust. Many accused her of being disrespectful. "You know what's disrespectful, the way that nuclear waste is dumped on our lands and the way that our women go missing and the way that the police treat us," Lee said. "So I have no problem with sticking my tongue out at someone who doesn't respect me." Erica Violet Lee is currently studying philosophy and political studies at the University of Saskatchewan. (Facebook)Lee isn't a stranger to controversy. She's been actively involved with Idle No More and was a driving force behind the movement to change the sports team name at her high school. She also writes a blog called Moontime Warrior about her experience as an indigenous woman who lives to challenge the status quo. "We don't have to be invisible and there are forces that try and keep us invisible," she said. "And so to speak out in whatever way we can is the most powerful thing we can do to change what happens in this country, which is ongoing colonialism." Being silent is not something that runs in Lee's family. She was raised by a single mother in inner-city Saskatoon, a mother who was also involved in social activism and often took her along to anti-poverty meetings and rallies. Lee said growing up in the inner city, where she witnessed violence in the community, also taught her that being silent was going to get her killed. "The only thing that offered me any kind of protection was being a loud mouth and to shout and scream and say, 'This isn't OK, this is wrong,'" she said. "That's how we survive, that's how we thrive, by being shouty." She said a shift is happening as more indigenous women identify as feminist and return to leadership roles. "One of the things I have been talking to a lot of my friends about is the need for native women to form solid fearless friendships in a place where we're often so isolated from each other. That was one of the goals of colonialism is to separate us, to dispossess us of each other. And so in building these strong friendships we're rebuilding nations."